RIDC or Research Institute on Destructive Cults is an institution established by few ex cult members to research about destructive cults, to understand their common characteristics, their organizational structure and their system of mind manipulation. This institute’s hope and desire is that with having better and real understanding of destructive cults, their leaders and their members, to make itself able to raise common understanding about this phenomena, inform people about it and its danger, help it’s victim to save themselves and assist ex-members to find a clear idea about what did happen to them during their membership, how and with what mechanism did it happen and how they can overcome its destructive effects and impacts on their daily life. Q & A with a reporter with Masoud Banisadr (author of Masoud: Memoirs of an Iranian Rebel, SAQI Books, 2004). I have had the pleasure of spending several hours with Masoud. In my professional opinion, the extreme influence (brainwashing) used by this destructive cult to recruit, indoctrinate and maintain control over their members ranks extremely high. Thanks so much for speaking with me. I think e-mail will work best, so I’ve put my questions below. Just as background, I’m writing about the potential role that the People’s Mujahedin could have in the current situation in Iran – specifically if supporting the MEK either publically or covertly could be beneficial to the U.S. and Israel, or if it could have an effect – either positive or negative – on Iran’s nuclear program. - Does funding or training the MEK or MEK operatives make strategic sense for either Israel or the United States? Or is it altogether a bad idea? - Could the MEK be actively trying to sabotage the Iranian regime and its nuclear program? - Is it in the United States’ interest to de-list the MEK as a terrorist organization? - What are the negative consequences of supporting the MEK? - If Israel chooses to launch a military strike against Iran, would the MEK be an important ally for Israel? - If you don’t mind me asking, why did you leave the MEK and what are your views toward the organization now? - Lastly, is there anything else I need to know, or anyone you think I should talk to? First let me answer your final question as it will be a good base for answering your other questions. In my view MEK since 1985 has changed into a destructive cult, why and how? I have explained it in an article that you can find it in below address. In short, I believe all violent or terrorist groups to survive have no choice but to change into a destructive cult. When in 1981 MEK’s strategy and all its tactics changed into a blind terrorism; to survive, she had no choice but gradually to change into a cult. To follow these two principles cults internally use different methods of mind manipulation (If you like to know more you can read my article on this subject in: http://www.banisadr.info/Inform.htm ) and externally they have theorized deceiving of others as part of their doctrine (in a way, I believe all destructive cults, ideologically are hypocrite); in simple word they openly and genuinely believe in ‘end justifies means’. Or in another word as Chameleon, they can change color in mater of few hours or even minutes due to circumstances or their immediate or long term interests. After Iranian revolution, late seventies and early eighties MEK could change from a guerrilla (or terrorist organization according to different people’s definition) into a popular political group attracting thousands of young people. But after moving back to terrorism, ignoring and violating people’s ethics, beliefs and principles, especially working with Iraq’s president, Saddam Hussein after the incursion of Iraq into Iran, they lost all their support inside Iran and as matter of fact in public view they changed into a traitor organization. Although they have about 3400 members in Iraq and another few thousands supporters in Europe and America, talking with any other Iranian (pro or against Iranian government, inside or outside of Iran) you can find out that, they are very much hated among Iranian and this is why no other opposition group (inside or outside or Iran) is ready to work with them. 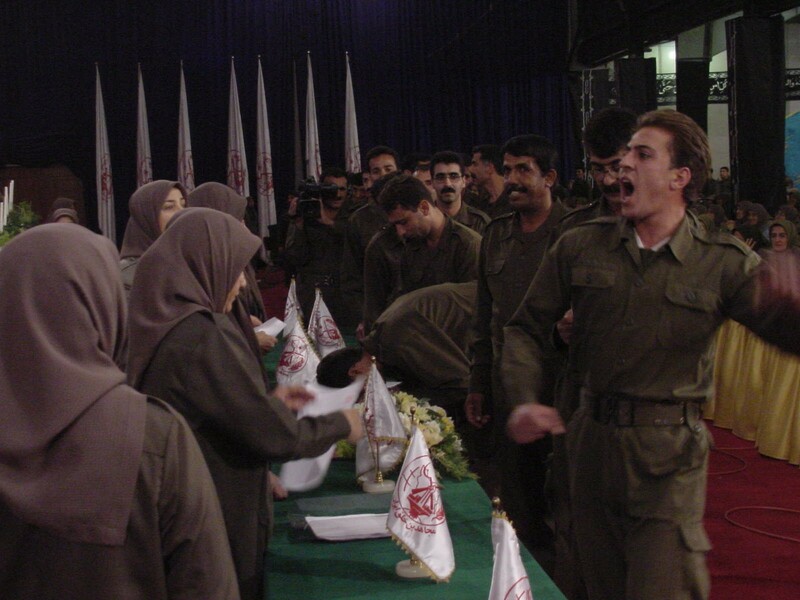 Average age of MEK members is about 45, and since they were disarmed by Americans in 2003, I can say majority of their members are too old and untrained for any real and effective military activities. Saying this, doesn’t mean that they cannot change back into a terrorist, able to kill few more soft targets, such as Iranian scientists. First; MEK is a destructive cult, to be a cult means, they always pursue their own specific interest. They might be useful in one occasion or another, but as a whole as they are not loyal toward any norms, ethics, principles or mutual agreement (except those two values of all destructive cults, mentioned above) like Al Qaeda, they cannot be trusted. Therefore strategically I believe it is not in the interest of anybody or any country to trust, not only the MEK but any destructive cults and should take note that any cooperation with them might soon change into their own nightmares as cooperation of the United States with Al Qaeda in Afghanistan during Soviet’s occupation, ended with the 9/11. Second; I have to separate your question in two parts first about Israel and then United States; as I think their interest on Iran, while due to lobby of AIPAC, it seems are the same, strategically are different. I genuinely think and feel, if the United States accepts the era of Shah has gone forever and recognizes Iran as it is; not only strategically they can live in peace with each other but also they might even change into a close allies (Well if you ask me why, then I have to write an essay, explaining culture of Iranian that is totally different from its western Arab neighbors or its civilization and its social and scientific progress which is different from its eastern and northern neighbors …) . However, even if the United States against its own interest and just for sake of tactical interest of Israel decides to work against present regime in Iran, it is against its own interest to capitalize on a group that, is a destructive cult, is like a balloon that looks big from without (because of sophistication of its propaganda tools) but empty from within; hated among Iranian and has no chance of gaining any support among them (Inside or outside of the country. Please don’t be deceived by MEK’s propaganda tricks including moving their two to three thousands members and supporters from one country to another or use of other nationalities in their gatherings for show of support among Iranian. Iran’s population is about 75 Million and there are more than two million Iranian who live in the United States and perhaps another million who live in Europe). For Israel, again if you are talking about strategic interest of Israelis, I feel and think their long term interest is in reaching to some kind of agreement with Palestinians and live with them in peace, coexistence and cooperation. In this case I think even present regime of Iran, not only is not an obstacle, but even can help both sides to reach to long lasting peace and friendship (As Jews have lived in Iran for thousands of years in peace and harmony with their Zoroastrian, Muslim and Christian neighbors). But if you are talking about government of Israel and especially its present extreme right wing government, although in the past they have used MEK for example for announcing Israel’s findings about Nathans enrichment site (where no other Iranian opposition group agreed to do this job) and they might have used them for assassination of Iranian scientists, still I think trusting a cult is not a good idea. Capitalizing on people who are under mind control of a destructive cult; all of them live in a psychological isolation and more than half of them have to live both in psychological and physical isolation from the wider society to remain loyal to the group and its leader, is very bad idea even for present government of Israel. I am sure they can find younger and more loyal mercenaries to do their dirty job rather than cooperating with MEK. Final word on this question; I genuinely think any cooperation of either the West, the United States or Israel with MEK is only beneficial to Iranian Regime in showing to Iranian; against all claims of the West for being supportive of Human Rights, Democracy and being against Terrorists, what kind of people they are supporting and what kind of government they are hoping to establish in Iran. It is more than thirty years that they are trying to harm Iran, and have not done much except terrorizing and killing few thousands soft targets and manipulating and deceiving few reporters and members of parliaments of Western countries. If during Sadam Hussein, when they were much younger, more united, and could benefit from unlimited resources of Iraq, including money, arms, and training, still couldn’t do much against Iran, or sabotaging any activity of Iran; it is very difficult to imagine they can do anything effective now. I wish all countries including the United States had a law against destructive cults; then there was no needs to have a law against terrorist groups as all terrorist organizations, to survive eventually have to change into a destructive cult. Please don’t forget that all destructive cults cannot be trusted for what they claim they are, and all of them can violate all civilized norms and ethics to survive. But as for now no country except perhaps France has such a law, de listing MEK in my view is a very bad idea. It will damage US claims of being against terrorists, or supportive of democratic groups (at least among Iranian); gives legitimacy to a destructive cult that violates all rights of its members; and damages long term relation between Americans and Iranian people. I feel it even might damage US’s prestige among Iranian, as bad as 1953 CIA’s coup d’état in Iran. I guess I answered it above. How?! I cannot see it. When we are talking about Israel’s military strike, we are only are talking about its Air strike and in this case they don’t need any people in the country as they have all the satellite plan of Iranian nuclear sites. Israel knows very well that with one, two or few even successful air strike against Iran, she cannot destroy nuclear activities of Iran; therefore I feel their aim would be to force Iran into a reaction which eventually will force the United States into war against Iran. In this case neither MEK, nor any other opposition groups are useful for either the US or Israel as Iraqis opposition groups were useless when the real war started against Sadam Hussein. For sure in this scenario all Iranian, including Iranian oppositions (inside and outside of Iran) will support present Iranian government. If you ask those who leave destructive cults, you might receive different answers. They might claim, suddenly they realized how bad they are; how manipulating they are; how much they deceive ordinary people for soliciting money or else; … in case of MEK, I have met those who claim; they suddenly realized that the organization is a traitor toward Iranian people, collaborating with Iranian enemies; or left them when they collaborated with Sadam Hussein, in suppressing and killing Iraqi Kurds, … But my sincere and honest answer is: I left them as I couldn’t change myself anymore and give them the reminder of my own personality, identity and individuality. Between 1978, when, we (I and my ex wife) became MEK’s supporter till 1996 when I escaped, through use of different techniques of mind manipulation I was forced to give them whatever they asked me; first any capital or material things we had; then any love, attachments or relation we had with our country, our family and friends in Iran; then when they asked all members to divorce their spouses, I lost love of my life, my dear wife and could not see my children for almost six years; I lost part of my health, and many times were on the edge of dying for them. Then in final stage of their system of mind manipulation, they asked us to divorce ourselves, our identity and personality; I tried and lost big part of it, but couldn’t do more so I escaped. I honestly cannot understand or accept claims of others who say they realized this or that so they left, as I think those who are under mind manipulation of a destructive cult, have no chance of seeing or realizing what they are doing or saying, to reject it. Only when they escape, by chance or due to inability to give what cults wants them to do more; and only after years of hard work they might be able to realize what has happened to them and what have they done for the cult. I guess I have said more than enough and perhaps by now, have given you a headache. A version of this op-ed appeared in print on August 14, 2011, on page SR5 of the New York edition with the headline: An Iranian Cult and Its American Friends, Elizabeth Rubin is a contributor to The New York Times Magazine, where her article "The Cult of Rajavi" appeared in July 2003. A FEW weeks ago I received an e-mail from an acquaintance with the subject line: Have you seen the video everyone is talking about? I clicked play, and there was Howard Dean, on March 19 in Berlin, at his most impassioned, extolling the virtues of a woman named Maryam Rajavi and insisting that America should recognize her as the president of Iran. Ms. Rajavi and her husband, Massoud, are the leaders of a militant Iranian opposition group called the Mujahedeen Khalq, or Warriors of God. The group’s forces have been based for the last 25 years in Iraq, where I visited them shortly after the fall of Saddam Hussein in April 2003. Mr. Dean’s speech stunned me. But then came Rudolph W. Giuliani saying virtually the same thing. At a conference in Paris last December, an emotional Mr. Giuliani told Ms. Rajavi, “These are the most important yearnings of the human soul that you support, and for your organization to be described as a terrorist organization is just simply a disgrace.” I thought I was watching The Onion News Network. Did Mr. Giuliani know whom he was talking about? Evidently not. In fact, an unlikely chorus of the group’s backers — some of whom have received speaking fees, others of whom are inspired by their conviction that the Iranian government must fall at any cost — have gathered around Mujahedeen Khalq at conferences in capitals across the globe. This group of luminaries includes two former chairmen of the joint chiefs of staff, Gens. Hugh H. Shelton and Peter Pace; Wesley K. Clark, the former NATO commander; Gen. James L. Jones, who was President Obama’s national security adviser; Louis J. Freeh, the former F.B.I. director; the former intelligence officials Dennis C. Blair and Michael V. Hayden; the former New Mexico governor Bill Richardson; the former attorney general Michael B. Mukasey, and Lee H. Hamilton, a former congressman who was co-chairman of the 9/11 Commission. Indeed, the Rajavis and Mujahedeen Khalq are spending millions in an attempt to persuade the Obama administration, and in particular Secretary of State Hillary Rodham Clinton, to take them off the national list of terrorist groups, where the group was listed in 1997. Delisting the group would enable it to lobby Congress for support in the same way that the Iraq Liberation Act of 1998 allowed the Iraqi exile Ahmad Chalabi to do. Mrs. Clinton should ignore their P.R. campaign. Mujahedeen Khalq is not only irrelevant to the cause of Iran’s democratic activists, but a totalitarian cult that will come back to haunt us. When I arrived at Camp Ashraf, the base of the group’s operations, in April 2003, I thought I’d entered a fictional world of female worker bees. Everywhere I saw women dressed exactly alike, in khaki uniforms and mud-colored head scarves, driving back and forth in white pickup trucks, staring ahead in a daze as if they were working at a factory in Maoist China. I met dozens of young women buried in the mouths of tanks, busily tinkering with the engines. One by one, the girls bounded up to me and my two minders to recite their transformations from human beings to acolytes of Ms. Rajavi. One said she had been suicidal in Iran until she found Ms. Rajavi on the Internet. At Camp Ashraf, 40 miles north of Baghdad, near the Iranian border, 3,400 members of the militant group reside in total isolation on a 14-square-mile tract of harsh desert land. Access to the Internet, phones and information about the outside world is prohibited. Posters of Ms. Rajavi and her smiling green eyes abound. Meanwhile, she lives in luxury in France; her husband has remained in hiding since the United States occupied Iraq in 2003. During the Iran-Iraq war in the 1980s, the group served as Mr. Hussein’s own private militia opposing the theocratic government in Tehran. For two decades, he gave the group money, weapons, jeeps and military bases along the border with Iran. In return, the Rajavis pledged their fealty. In 1991, when Mr. Hussein crushed a Shiite uprising in the south and attempted to carry out a genocide against the Kurds in the north, the Rajavis and their army joined his forces in mowing down fleeing Kurds. Ms. Rajavi told her disciples, “Take the Kurds under your tanks, and save your bullets for the Iranian Revolutionary Guards.” Many followers escaped in disgust. So the Rajavis then began preying on Iranian refugees and asylum seekers in Europe to fill their ranks. The Rajavis promise them salaries, marriage, family, freedom and a great cause — fighting the Iranian government. Then the unwitting youths arrive in Iraq. What is most disturbing is how the group treats its members. After the Iran-Iraq war, Mr. Rajavi orchestrated an ill-planned offensive, deploying thousands of young men and women into Iran on a mass martyrdom operation. Instead of capturing Iran, as they believed they would, thousands of them were slaughtered, including parents, husbands and wives of those I met in Iraq in 2003. After my visit, I met and spoke to men and women who had escaped from the group’s clutches. Many had to be deprogrammed. They recounted how people were locked up if they disagreed with the leadership or tried to escape; some were even killed. Friendships and all emotional relationships are forbidden. From the time they are toddlers, boys and girls are not allowed to speak to each other. Each day at Camp Ashraf you had to report your dreams and thoughts. If a man was turned on by the scent of a woman or a whiff of perfume, he had to confess. Members had to attend weekly ideological cleansings in which they publicly confessed their sexual desires. Members were even forced to divorce and take a vow of lifelong celibacy to ensure that all their energy and love would be directed toward Maryam and Massoud. Mr. Hamilton and Generals Jones and Clark have been paid speakers’ fees by front groups for Mujahedeen Khalq and have spoken in support of the group in public conferences. They claimed ignorance of how the group treated its members. “I don’t know a lot about the group,” Mr. Hamilton told me over the phone last week. But in 1994, when he was chairman of the House Foreign Affairs Committee, Mr. Hamilton received a report describing the group as a violent cult with a distinct ideology synthesizing Marxism and messianic Shiism. IN fact, a 2004 F.B.I. report on the group detailed a joint investigation by the American and German police, which revealed that the group’s cell in Cologne, Germany, had used money from a complex fraud scheme to buy military equipment. The group used children with multiple identities to claim multiple benefit checks from the German government. Evidence also showed that the group had obtained money in Los Angeles to purchase GPS units to increase the accuracy of planned mortar attacks on Tehran. It is possible that such plots do not bother General Jones and other supporters of the group. But Iraq will no longer tolerate its presence. Its government wants the Mujahedeen Khalq out of the country by the end of the year. In April, Iraqi forces attacked Camp Ashraf. General Jones and other supporters of the group were outraged. They are right that we should have compassion for those trapped inside the camp. A 2009 RAND Corporation study found that at least 70 percent of the group’s members there were being held against their will. If the group’s American cheerleaders cared for those at the camp half as much as they did for the Rajavis, they would be insisting on private Red Cross visits with each man and woman at Camp Ashraf. By using the Mujahedeen Khalq to provoke Tehran, we will end up damaging our integrity and reputation, and weaken the legitimate democracy movement within Iran. As a senior State Department official told me, “They are the best financed and organized, but they are so despised inside Iran that they have no traction.” Iranian democracy activists say the group, if it had had the chance, could have become the Khmer Rouge of Iran. If the group is taken off the terrorist list, it will be able to freely lobby the American government under the guise of an Iranian democracy movement. Recent history has shown that the United States often ends up misguidedly supporting not only the wrong exile groups in the Middle East, but the least relevant ones. We cannot afford to be so naïve or misguided again. For more than 30 years, the Mujahedeen Khalq, or People's Mujahedeen, has survived and operated on the margins of history and the slivers of land that Saddam Hussein and French governments have proffered it. During the 1970's, while it was still an underground Iranian political movement, you could encounter some of its members on the streets of New York, waving pictures of torture victims of the shah's regime. In the 80's and 90's, after its leaders fled Iran, you could see them raising money and petitioning on university campuses around the United States, pumping photographs in the air of women mangled and tortured by the Islamic regime in Tehran. By then, they were also showing off other photographs, photographs that were in some ways more attention-grabbing: Iranian women in military uniforms who brandished guns, drove tanks and were ready to overthrow the Iranian government. Led by a charismatic husband-and-wife duo, Maryam and Massoud Rajavi, the Mujahedeen had transformed itself into the only army in the world with a commander corps composed mostly of women. Until the United States invaded Iraq in March, the Mujahedeen survived for two decades under the patronage of Saddam Hussein. He gave the group money, weapons, jeeps and military bases along the Iran-Iraq border -- a convenient launching ground for its attacks against Iranian government figures. When U.S. forces toppled Saddam's regime, they were not sure how to handle the army of some 5,000 Mujahedeen fighters, many of them female and all of them fanatically loyal to the Rajavis. The U.S soldiers' confusion reflected confusion back home. The Mujahedeen has a sophisticated lobbying apparatus, and it has exploited the notion of female soldiers fighting the Islamic clerical rulers in Tehran to garner the support of dozens in Congress. But the group is also on the State Department's list of foreign terrorist organizations, placed there in 1997 as a goodwill gesture toward Iran's newly elected reform-minded president, Mohammad Khatami. With the fall of Saddam With the fall of Saddam and with a wave of antigovernment demonstrations across Iran last month, the Mujahedeen suddenly found itself thrown into the middle of Washington's foreign-policy battles over what to do about Iran. And now its fate hangs precariously between extinction and resurrection. A number of Pentagon hawks and policy makers are advocating that the Mujahedeen be removed from the terrorist list and recycled for future use against Iran. But the French have also stepped into the Persian fray on the side of the Iranian government -- who consider the Rajavis and their army a mortal enemy. In the early-morning hours of June 17, some 1,300 French police officers descended upon the town of Auvers-sur-Oise, where the Mujahedeen established its political headquarters. After offering the Iranian exiles sanctuary on and off for two decades and providing police protection to Maryam Rajavi, the French mysteriously arrested Rajavi along with 160 of her followers, claiming that the group was planning to move its military base to France and launch terrorist attacks on Iranian targets in Europe. Immediately, zealous Mujahedeen members in Paris, London and Rome staged hunger strikes, demanding the release of Maryam, and several set themselves ablaze. In Washington, Senator Sam Brownback, Republican of Kansas and chairman of the Foreign Relations subcommittee on South Asia, accused the French of doing the Iranian government's dirty work. Along with other members of Congress, Brownback wrote a letter of protest to President Jacques Chirac, while longtime Mujahedeen champions like Sheila Jackson-Lee, Democrat of Texas, expressed their distress over Maryam's arrest. But few, if any, of these supporters have visited the Mujahedeen's desert encampments in Iraq and know how truly bizarre this revolutionary group is. Recently, I went to visit Camp Ashraf, the main Mujahedeen base, which lies some 65 miles north of Baghdad in Diala province, near the Iranian border. Ashraf is 14 square miles of ungenerous desert surrounded by aprons of barbed wire, gun towers and guards in trough-like bunkers, shaded by camouflage netting and dehydrated palm trees, their trunks thickened by dust. As you pass the checkpoints and dragons'-teeth tire crunchers into the tidy military town, you feel you've entered a fictional world of female worker bees. Of course, there are men around; about 50 percent of the soldiers are male. But everywhere I turned, I saw women dressed in khaki uniforms and mud-colored head scarves, driving back and forth along the avenues in white pickups or army-green trucks, staring ahead, slightly dazed, or walking purposefully, a slight march to their gaits as at a factory in Maoist China. Pari Bahshai, a stocky Iranian woman in her mid-40's and the military commander of Ashraf, was my tour guide for the day. We drove through the grounds in her white Land Cruiser out to a dry, burning plain where dozens of young women were buried in the mouths of their tanks -- adjusting, winching, tinkering with the circuits and engines that keep their fighting machines alive. There were neat rows of Brazilian Cascavel tanks, Russian BMP armored vehicles and British Chieftains, most of them captured from Iran at the end of the Iran-Iraq war. Several months ago, she e-mailed the Mujahedeen, who then facilitated her passage to Turkey, where she was met at the border, put on a train to Ankara and then Iraq. ''I was educated in courses of Mujahedeen history, Iranian history and the current political situation,'' she carried on. ''Now I'm in artillery class.'' She explained what it was like to be in Iraq during the U.S. bombing. ''I was scared, but I reminded myself that I came to struggle against fundamentalism, and the fact that I was a member of the Mujahedeen family gave me strength.'' And then she stopped, said thank you and went away. Nadereh, an Iranian woman who had grown up in Toronto, told me she had broken off her engagement to come to Iraq. ''I was living the best life in Toronto,'' she said. ''I was studying physiotherapy and body mechanics. I had friends and family. But I was lacking something.'' Then one day in 1998 she lay on her bed staring at the ceiling, and heard on Iranian TV that Assadollah Lajevardi, known as the butcher of Evin, the political prison in Tehran where thousands of Mujahedeen were tortured and executed, had been assassinated. The Mujahedeen claimed to have carried out the celebrated operation. ''I couldn't stand it anymore. I thought, What are you doing for your people?'' Now she drives a Katyusha rocket truck. Though Maryam Rajavi spends most of her time in France or lobbying in the West, her smiling green eyes stalk Camp Ashraf almost as ubiquitously as the image of Saddam in Iraq or Khomeini in Iran. Her photographs in flowery blouses grace bedsides, dining tables, lecture halls and even tanks. Back in the 1960's, the founders of the Mujahedeen were students who melded revolutionary Islam with Marxism, and they were among the few to battle the shah with weapons. Like other radical students in the 60's, they rejected bourgeois values, spurned individualism and found respite in the militarized life of a cause. They were also vehemently against U.S. involvement in Iran and killed several Americans working in Tehran. Most of the student leaders -- except Massoud Rajavi and a few others who were in prison -- were executed in the 1970's. After the shah was overthrown in 1979, Rajavi, with his charismatic style, gathered thousands of followers. He initially supported Khomeini, but quickly fell out with him and his ring of clerics. And in 1981, he plotted to bring down the Islamic regime. Rajavi dispatched his people into the streets of Tehran, and many were summarily executed. The Mujahedeen detonated a powerful bomb that killed more than 70 officials in the Iranian theocracy. (Today's supreme leader, Ali Khamenei, lost the use of his right arm in one such explosion that year.) In retaliation, thousands of Mujahedeen members were arrested and then executed or tortured inside Evin Prison -- including many of today's Mujahedeen commanders in Iraq. Rajavi fled to Paris in disguise. There, he established the National Council of Resistance in Iran, the political umbrella of the Mujahedeen. In 1986, the French began forging ties with Khomeini and kicked out Rajavi and his squads of assassins, who ran into the arms of Saddam Hussein. 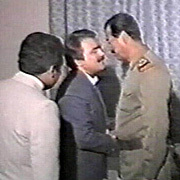 Hussein had been welcoming the Mujahedeen for several years. (Many Mujahedeen political supporters did stay on in France as political refugees.) Rajavi, in return, betrayed his own countrymen, identifying Iranian military targets for Iraq to bomb, a move most Iranians will never forgive. Then, right after the Iran-Iraq cease-fire in 1988, as if orchestrating the tragic turning point in his own Rajavi Opera, he launched thousands of his warriors on ''Operation Eternal Light'' across the border to capture Iranian territory. Two thousand Mujahedeen fighters -- many of them the parents, husbands and wives of those who are now in Iraq -- were killed by the Revolutionary Guard. Rajavi liked having women around him and overhauled the command structure to replace the men with women -- this time calling it a ''constitutional revolution.'' It was also politically astute and added alluring spice for their public-relations campaign in the West. As the leaders like to boast, the Mujahedeen is a family affair. (''We have three generations of martyrs: grandmothers, mothers, daughters.'') Most of the girls I was meeting had grown up in Mujahedeen schools in Ashraf, where they lived separated from their parents. Family visits were allowed on Thursday nights and Fridays. When Iraq invaded Kuwait, many of these girls were transported to Jordan and then smuggled to various countries -- Germany, France, Canada, Denmark, England, the United States -- where they were raised by guardians who were usually Mujahedeen supporters. When they were 18 or 19, many of them decided to come back to Iraq and fill the ranks of the youngest Mujahedeen generation. Though ''decided'' is probably not the right word, since from the day they were born, these girls and boys were not taught to think for themselves but to blindly follow their leaders. ''Every morning and night, the kids, beginning as young as 1 and 2, had to stand before a poster of Massoud and Maryam, salute them and shout praises to them,'' Nadereh Afshari, a former Mujahedeen deep-believer, told me. Afshari, who was posted in Germany and was responsible for receiving Mujahedeen children during the gulf war, said that when the German government tried to absorb Mujahedeen children into their education system, the Mujahedeen refused. Many of the children were sent to Mujahedeen schools, particularly in France. The Rajavis, Afshari went on to say, ''saw these kids as the next generation's soldiers. They wanted to brainwash them and control them.'' Which may explain the pattern to their stories: a journey to self-empowerment and the enlightenment of self-sacrifice inspired by the light and wisdom of Maryam and Massoud. Though Maryam and Massoud finagled it so they could be together, they forced everyone else into celibacy. ''They told us, 'We are at war, and soldiers cannot have wives and husbands,''' Afshari said. ''You had to report every single day and confess your thoughts and dreams. They made men say they got erections when they smelled the perfume of a woman.'' Men and women had to participate in ''weekly ideological cleansings,'' in which they would publicly confess their sexual desires. It was not only a form of control but also a means to delete all remnants of individual thought. One of the most disturbing encounters I had in Ashraf was with Mahnaz Bazazi, a commander who had been with the Mujahedeen for 25 years. I met her in the Ashraf hospital. Bazazi was probably on drugs, but that didn't explain the natural intoxication she was radiating, despite -- or perhaps because -- she had just had her legs amputated after an American missile slammed into the warehouse she was guarding. The doctor told me he never heard her complain. ''Even in this way, she's confronting the Mullahs,'' he said. Bazazi interrupted him. ''This is not me personally,'' she said in a soft high voice. ''These are the ideas of the Mujahedeen. It's true I lost my legs, but my struggle will continue because I have a wish -- the freedom of my country.'' At the foot of her bed, surrounded by candles, stood a large framed photograph of Maryam in a white dress and blue flowered head scarf. In the chaotic days after the fall of Baghdad, several Mujahedeen members managed to flee the military camps and were in Kurdish custody in northern Iraq. Kurdish officials told me they weren't sure what to do with them. One was Mohammad, a gaunt 19-year-old Iranian from Tehran with sad chestnut eyes. He hadn't heard of the Mujahedeen until one day last year when he was in Istanbul desperately looking for work. A Mujahedeen recruiter spotted him and a friend sleeping on the streets, so hungry they couldn't think anymore. The recruiter gave them a bed and food for the night, and the next day showed them videos of the Mujahedeen struggle. He enticed them to join with an offer to earn money in Iraq while simultaneously fighting the cruel Iranian regime. What's more, he said, you can marry Mujahedeen girls and start your own family. The Mujahedeen seemed like salvation. Mohammad was told to inform his family that he was going to work in Germany and given an Iraqi passport. The first month at Ashraf, he said, wasn't so bad. Then came the indoctrination in the reception department and the weird self-criticism sessions. He quickly realized there would be no wives, no pay, no communication with his parents, no friendships, no freedom. The place was a nightmare, and he wanted out. But there was no leaving. When he refused to pledge the oath to struggle forever, he was subjected to relentless psychological pressure. One night, he couldn't take it anymore. He swallowed 80 diazepam pills. His friend, he said, slit his wrists. The friend died, but to Mohammad's chagrin, he woke up in a solitary room. After days of intense prodding to embrace the Mujahedeen way, he finally relented to the oath. He trundled along numbly until the Americans invaded Iraq, when he and another friend managed to slip out into the desert. They were helped out by Arabs, and then turned themselves over to the Kurds, hoping for mercy. Mohammad fell ill, and the next thing he knew he was in prison. ''The Mujahedeen has a good appearance to the outside world, but anyone who has lived among them knows how rotten and dirty they are,'' he said. Another Iranian whom I met at the Kurdish prison told me that he had been a zealous Mujahedeen supporter for years in Iran, and when he finally made it to the Iraqi camps, he was horrified to discover that his dream was a totalitarian mini-state. Before I left Camp Ashraf, Massoud Farschi, one of the Mujahedeen spokesmen who was educated in the United States, told me that he thought the Mujahedeen was in the best position it had ever been in. ''We've said all along that the real threat in the world is fundamentalism, and now the world has finally seen that.'' The Mujahedeen, he said, is the barrier to that fundamentalism. Nevertheless, two days later, in early May, Gen. Ray Odierno of the Fourth Infantry Division was dispatched to the camp to negotiate the Mujahedeen's surrender. American tanks were posted outside Ashraf's gates, and two B-52's were circling the skies above. After a day of discussion, the Mujahedeen commanders reached a capitulation agreement in which they would consolidate their weapons and personnel into two separate camps. Lt. Col. John Miller, also with the Fourth, attended a ceremony in which the men and women bid farewell to their tanks. ''We saw folks kissing their vehicles, hugging them,'' he said. One 50-year-old man broke down in front of them, wailing. The women, he said, were much more controlled. Not so the women in Europe, who until recently were crying on the streets for the release of their beloved Maryam. They got their wish; a court ordered her released on bail. As for Massoud Rajavi, he has not uttered a peep. In fact, he seems to have disappeared. Some Iraqis claim to have seen him a few days before Baghdad fell boarding a helicopter south of the capital. Meanwhile, inside Iran, the street protesters risking their lives and disappearing inside the regime's prisons consider the Mujahedeen a plague -- as toxic, if not more so, than the ruling clerics. After all, the Rajavis sold out their fellow Iranians to Saddam Hussein, trading intelligence about their home country for a place to house their Marxist-Islamist Rajavi sect. While Mujahedeen press releases were pouring out last month, taking undue credit for the nightly demonstrations, many antigovernment Iranians were rejoicing over the arrest of Maryam Rajavi and wondering where Massoud was hiding and why he, too, hadn't been apprehended. This past winter in Iran, when such a popular outburst among students and others was still just a dream, if you mentioned the Mujahedeen, those who knew and remembered the group laughed at the notion of it spearheading a democracy movement. Instead, they said, the Rajavis, given the chance, would have been the Pol Pot of Iran. The Pentagon has seen the fatal flaw of hitching itself to volatile groups like the Islamists who fought the Soviets in Afghanistan and, more recently, the Iraqi exile groups who had no popular base at home. It seems dangerously myopic that the U.S. is even considering resurrecting the Rajavis and their army of Stepford wives. Elizabeth Rubin is a frequent contributor to the magazine. Her last article was about political reformers in Iran. 1. Pmoi is a cultic organization which its members do not have any authority to make a decision . the Iranians who are captive in this cult , for years have been deprived of having any access to the Media . the pmoi members have been deprived of the preliminary facilities such as Radio, TV, Telephone, internet, and Newspaper , and the News which is given to the members of this cult is censored and chosen by the pmoi operatives. For this reason the members of this cult do not have any idea about their rights and international laws to make a decision freely and consciously . 2. The leaders of this cult by severe strangulation and suppression against their own members inside the organization and making false and fake accusations against all separated members of this cult , have created great concern and fear inside the organization and as a result of that the members of this cult because of their fear of punishment do not dare to leave the cult. the members who want to separate from the cult will be facing harsh and cruel punishments such as forcible participation in brainwashing sessions which in these sessions they will be beaten up and in continuation they will be facing imprisonment accompanied by inhuman tortures and in some cases even the dissidents got executed and disappeared . 3. This cult by different ways and methods brainwashes its own members and during many years of nonstop brainwashing, it has filled the head of its own members with many lies, for instance if someone separates from the cult will be indicted by Iranian and Iraqi intelligence service and they will be imprisoned , tortured and finally executed by them , so the members of this cult because of their fear of being caught and executed , do not dare to leave this cult whatsoever. 4. From 2003 to 2009 the Ashraf camp had been under the supervision and control of the US army and during those years , they had been receiving many facilities such as medication and medicine, medical facilities , fuel and food but non of those stuffs had never reached to the hands of the cult members and instead those items were sold in Iraq black markets or they were used by the leaders and operatives of this cult. For instance I programmed a database for the pharmacy in Ashraf camp and to complete this programming I was going to this pharmacy consecutively for one year . I had seen many times that very big size boxes of medicine by the dimensions of 2 cubic meters were given to that pharmacy by the US army but during those years I had never seen even one of those medicines in the hands of the cult members whatsoever, and instead the leaders of this cult were saying to their patients that the Iraqi government does not allow the medical facilities to enter to the camp and we do not have any medicine . 5. The death of the patients and the wounded of this cult as a result of the lack of treatment : I would like to draw your attention to the health situation of the two of my friends , the first one Mr. Abbas Haj Husseini who in one of the cult military operations in 1988 got wounded by a bullet in his Cervical Spinal Cord and he got paralyzed , Abbas always wanted to go to Europe to be treated and cured but the leaders of this cult not only did not pay attention to his request , but also as I saw twice he was threatened by Massoud Rajavi , the leader of this cult , to be handed over to the Iranian government. The first time was in 1995 and the second time was in 2002 , but unfortunately as a result of the lack of attention and treatment , he died and was buried in pmoi cemetery called Ghatayeh Morvarid( The Pearl) in Ashraf Camp. 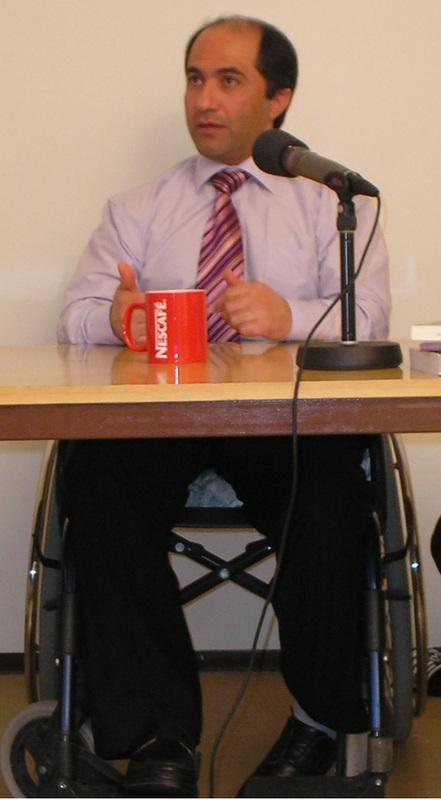 My second friend , Mr. Farhad……… who in one of the pmoi military operations in 1986 got wounded by a bullet in his Lumbar Spinal Cord and he got paralyzed . Farhad always wanted to leave this cult but the leaders of this cult rejected his request all the time and finally in 2008 as a result of the foot bone fracture and the lack of treatment ,his foot got infected and he died. 6. The leaders of this cult have been always endeavoring and struggling to cover up and conceal the situation of their patients and wounded so no international organizations be able to have access to these patients and wounded because the leaders of this cult do not want to be accountable and responsive for their death . According to the facts mentioned above , I am urging you to pay special attention to those patients and wounded and their juridical situation be prioritized so they can be able to have access to the doctor and medicine as soon as possible to prevent the death of many more. I had been in this cult till 2009, till then the number of the wounded , paralyzed and mutilation , was 50 and after 2009 during two conflicts which occurred in there , the number of injured has increased. To help these people , first you should take them out of the cult perimeter so they can meet their medical needs and get familiar with their rights to make a decision for their future and life freely and consciously . in this regard I am ready to cooperate with you voluntarily and even, if it is necessary to go to Iraq to help those people , I will do it. 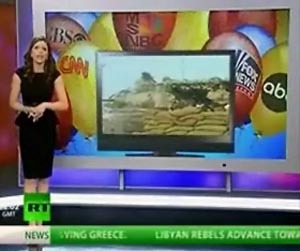 The Alyona Show on RT – Russian English –Language news Channel suggests the US media focus on the “Lobbyist in Capital Hill with pockets stuffed with MEK’s money”, on July 9th. The show criticizes US officials’ hypocrisy and double-standard sell the cause of terrorists. Comparing MEK with Al-Qaida the show poses the question that how a terrorist designated organization can be debated in a hearing held in the US congress.